Some writers get the stories they deserve. Hunter Thompson got the Angels. Tom Wolfe got the Pranksters. Sy Hersh got My Lai. Bob Woodward and Carl Bernstein got Watergate. Robert Caro got Moses and LBJ. Kate Boo got Annawadi. I got the Bork tapes. Upon learning, during the September 1987 Senate hearings on Robert Bork’s nomination to the Supreme Court, that the bearded judge and I frequented the same video store, and noting that my fellow strict constructionist read Griswold v. Connecticut to mean that the Constitution affords no penumbral guarantee of privacy, I had an idea. I sidled into the store and, saying I wanted to write about my man’s taste in movies, asked to see the Bork rental list. Sure, replied the assistant manager, who knew I wrote for Washington City Paper. There are a lot of entries. Okay if I make a Xerox? City Paper didn’t pay much, so I wrote what I wanted the way I wanted, and I enjoyed changing it up. My last big story had been a heart warmer. This time around, I wanted to wax mean—not to the judge necessarily, though I was (I can’t say why exactly; it might’ve been that demonic Time cover photo, the one presaging those Palin/Bachmann crazy-lady snaps), but definitely to the Borkophobes scraping around for reasons to keep the big guy out of the Supremes. Ted Kennedy and Norman Lear, I’m looking at you. Unfortunately, printed irony is in the eye of the beholder, and many more people heard about the article than read the article, so the assumption came to be that I was anti-Bork when I’m simply a wisenheimer. I plead guilty to making sport of the judge’s taste in cinema and to skylarking relentlessly. I had to; otherwise the story I got was only a story insofar as I had gotten it; as a pal said, “Lotta wind-up. Not much pitch.” By the way, amid the filigree I was the first person I know of to use “Bork” as a verb. I’m just saying. Judge Bork was a stand-up guy about my intrusion; nope, he said, no penumbral guarantee, fire away. Later, at a White House Correspondents Association throwdown, I approached him and, deliberately failing to introduce myself, gestured to a photographer. The judge amiably tugged a third party into the frame, and somewhere there is a nicely lit photo of me with Judge Robert Bork and Justice Anthony Kennedy. This tempest in a teapot continues to reverberate. Last week, as Judge Bork lay dying, Congress was monkeying once again with the law put in place after his video data went out the barn door with me. Every few years, whether because it’s keeping Blockbuster from aggregating mailing lists or giving Facebook and Netflix agita as they try to interlace, that law comes up for discussion, and as long as Americans are discussing privacy, Judge Bork and I will share the occasional paragraph, as in this week’s obituaries but also journals, books, and news reports. 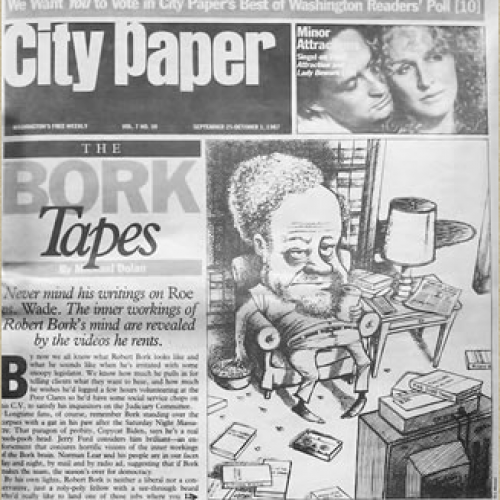 The paragraph often says City Paper published the Bork tapes list. This did not happen; I still have the lists, and nobody has published them. New York Times and Caroline Kennedy, I’m looking at you. New Yorker blog guy—good job. Not that I complain. How many scribblers can say that, a quarter century after they wrote a feature for an off-the-floor weekly, people are still talking about it, or that their writing triggered a federal law that still makes headlines? Don’t hold your breath, but I’m feeling pretty perky about the kind of play my obituary will be getting. Michael Dolan, senior editor of World War II magazine, is the author of The American Porch: An Informal History of an Informal Place (Lyons Press) and the play Desert One.